Two years ago I weighed 150 pounds, which might not have been remarkable, except I am only 5 feet tall. I was a lit-tle por-ky. Plus I didn’t feel good, my knees hurt all the time and my blood pressure was too high. In high school I weighed 108 pounds and even after having two kids in my 20’s, most of my adult life I weighed about 110. I also smoked and never ate sweets (I’m a salt person, remember). Well, when I was 40 I remarried and decided to have another baby. (I hear you thinking, Was she nuts?) So I quit smoking and gained 10 pounds. Had the baby and gained 10 pounds. Went to culinary school, including a Certificate in Pastry and Baking, became a foodie and gained 10 pounds. Well, you get the idea. So I decided to go on a diet. I had taken off a few pounds in previous years doing the Atkins diet, so I started off with that. But after losing 15 pounds, I could not look at another hard-cooked egg or cube of cream cheese. I was doing some research on the internet about diets and ran across a website that compared all the popular diets out there, including Atkins. His description was spot on, so when I read that in his opinion Weight Watchers was the only diet and method that not only took the weight off, but allowed you keep it off, I was willing to give it a try. Fortunately there was a Weight Watchers class about five minutes from my house. I went there, sat through one lecture and signed up. I was lucky to find a leader that was a great stand-up comedienne, whose name was Loretta. And I made a friend that I met up with each week. So I went for a year, losing about 1 pound a week and eventually got down to 100 pounds. What I learned was portion control. And not to eat any white stuff: potatoes, rice, bread, pasta., etc. And I journaled everything I ate every day and counted the calories. It really worked. It was so interesting to treat food, eating and my body as a cause and effect science experiment. But I’ll have to tell you, don’t ever try to feed me a whole wheat tortilla. They are one of the most disgusting things I have ever tasted. 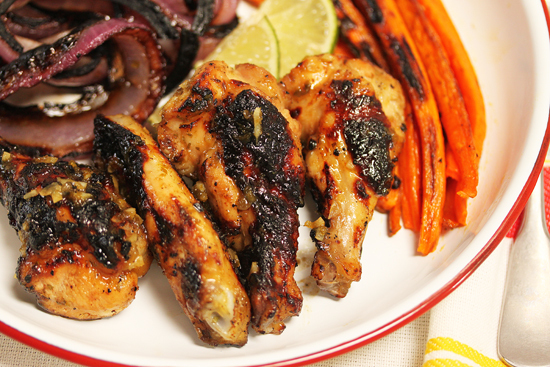 So what does all that have to do with Mojito Grilled Lime Chicken Wings? This recipe is a Weight Watcher recipe that I copied out of a WW cook book in the classroom, but didn’t write down the title. My big problem while on that diet was finding food that tasted really good that didn’t have tons of calories. The first time I ate these Chicken Wings, I was completely blown away with how astounding they were. Of course, on the WW diet, you only got to eat two pieces. LOL. However, now that I am not on that diet any longer, I ate a whole bunch of them. The first time I fed them to my 22 year old son, I asked him what he thought. “Oh my god, these are freaking amazing! !” he said. It was hard to photograph these wings because of the lime sauce glaze, which gave the whole thing a weird looking texture. But you get the idea. 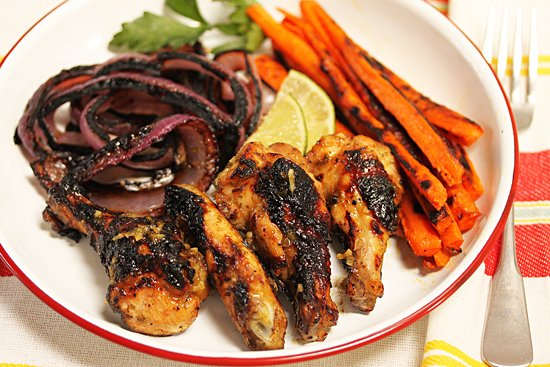 The red onion slices were brushed with balsamic vinegar and olive oil and the carrots with olive oil, and both grilled alongside the chicken. If you like that South of the Border taste combination of lime-cumin-garlic, then you must try these. 1. Mix marinade ingredients in a bowl. Reserve half of marinade in refrigerator. 2. Put half of marinade in a ziplock bag with chicken wings. Squeeze out all air. Turn to coat. Refrigerate 2 hours or over night. 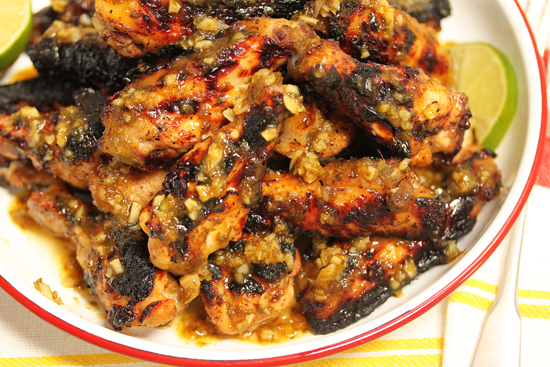 Remove wings from marinade and scrape off excess solids. 3. BBQ on grill rack, turning occasionally, 20-30 minutes. 4. Pour refrigerated marinade into saucepan and simmer until slightly thickened. 5. Transfer chicken wings to platter and spoon warm lime sauce on top. Isn’t it amazing how great food like this can taste? Not only is it flavorful, but it is also so good for our bodies. I love making food like this instead of relying on heavily packaged “diet” foods that probably end up doing more harm than good. Thanks for sharing! Hmmm, I’m thinking I’d need WW after eating that whole platter myself (remember, I’m a binger). I loved reading about your past and would like to hear more about your culinary and pastry class days! Gah! I have grilled veggies post coming up. I should have waited for this chicken recipe to cook along with my peppers and eggplant! And I hear ya about gaining “a pound here, a pound there”. I need to do better. My challenge: cutting out the carbs. Sweets aren’t so bad; liquor is my nemesis! I’m so glad you stopped the Atkins diet and moved to WW! Atkins is just not actually good for you at all. These wings though…drool. Proof that you can have good food and still “diet”! Mojito, lime, grill chicken-YUM!!! I love this recipe and so will my husband. This looks looks delicious and I LOVE that its light! My story so far goes–I started blogging and gained 10 lbs! Trying to get it under control! You know, I cut out everything white from my diet because I had gestational diabetes (twice – but very well controlled with diet). I kept it up for well over a year until old habits started creeping up slowly (mostly because it’s very hard for me to find non-white options for flours/rice/pastas etc where I live). But I always tell anyone who will listen: cutting out the white stuff (white sugar, flour, pastas, rice, potatoes) did wonders for me: I kept weight off and not only felt extremely energetic but also looked fantastic. Your chicken wings look fantastic by the way! These look amaaaazing! 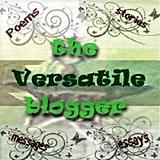 Thanking you for stopping by my blog, answered you there. P.S. I think it is great that you managed to lose all that weight, and that you had a baby after 40 and accomplished all you did! Way to go, there should be more women out there like you. Some people just lose vital energy as they go on. Yeah it’s all about portion control isn’t it?! haha 2 pieces only?! eeeek. I find it really hard not eating any white food like rice/pasta…that’s the biggest challenge for me…because if i don’t have them in a meal i dont feel ‘full’. your chicken wings look amazingly delicious!!! I just started back exercising, I have put on 10 pounds since all my blogging this summer! making food that is healthier for us is definitely the key! Lynne, I’m sold! Bookmarking this for future consumption. 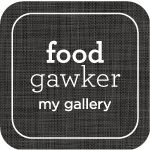 Sigh… Since starting my food blog (November 2009), I’ve gained about 30 lbs. And I’m only 5′2″. Next time I see you, you’ll have to tell me how you were diligent enough to stick through WW to reach your goal!